Did you know that Santa is having a Ugly Sweater Christmas party! 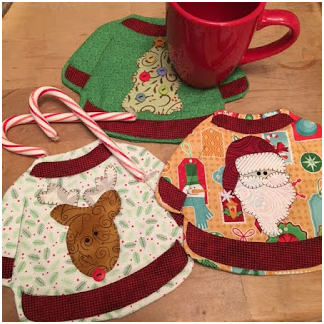 Santa and his reindeer are all so very excited about getting ready for the holidays! 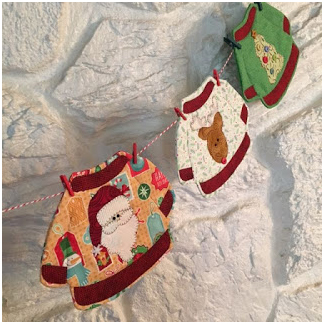 Quilt Doodle Designs makes it easy for you to get ready for the holidays too with their Ugly Christmas Sweater pattern. 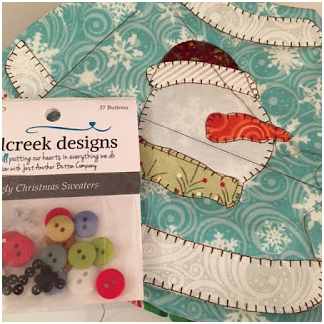 It’s never too early to work on a little Christmas project. 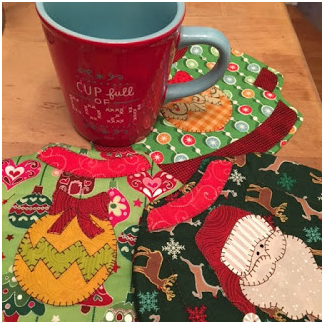 All you need is some scrap Christmas fabrics, or a fat quarter bundle of your favorite holiday fabric and a free afternoon. 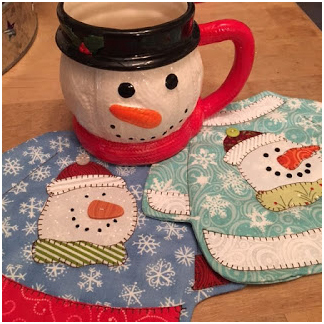 They make quick gifts and are adorable paired up with a mug and some chocolate. 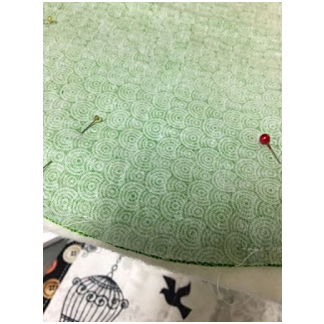 This is a fun pattern and would make a wonderful afternoon workshop for your quilt shop! Button Kits are available from Just Another Button Co.
Pin your sweater body right sides together onto your batting. 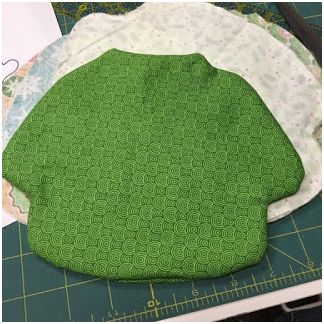 I like to use batting scraps for these types of projects. Remember to leave an opening so you can turn it right side out. The super fun part is decorating your sweaters. 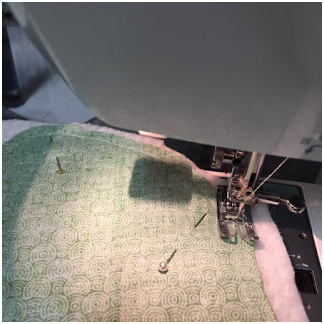 Trace all your design pieces onto your heat n bond, iron onto the wrong side of the fabric scraps and cut out. 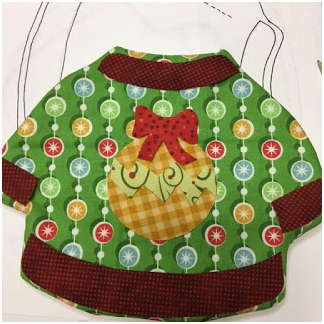 A Christmas Ornament ugly sweater. Isn’t it cute and it’s not even done yet! I got one of each design put together. 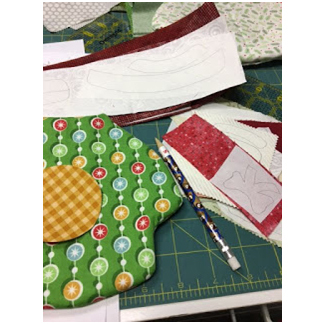 I’m now ready to do my applique stitch. 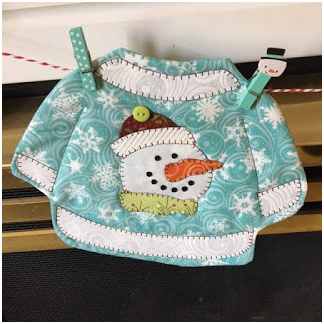 I used a dark brown thread from Aurifil. I use the same color thread for all of my mug rugs just for ease of getting them all done quickly without changing thread colors. 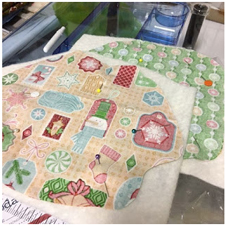 What’s great about this step is that you are appliqueing and quilting your mug rugs all at the same time. So easy! 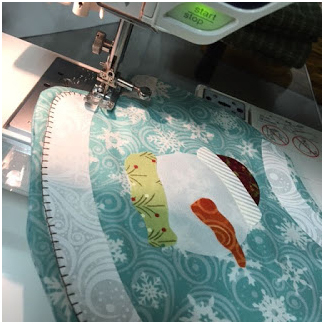 After all my mug rugs are appliqued, it’s time to camp out in front of the TV for some hand work. As you can see, I have lots of threads to clip. I’ve put together a button pack for you thru Just Another Button Company with all the embellishments for the mug rugs. The pack contains enough buttons to do one of each design plus some extras… I added some snowflake buttons too. This slick button kit is also available in my Etsy Store. Shhhh, this one’s my favorite..
Another super fun thing you can do with these is make a bunch and sting them together to make a garland! All you need is some red and white baker’s twine and some decorative clothespins. 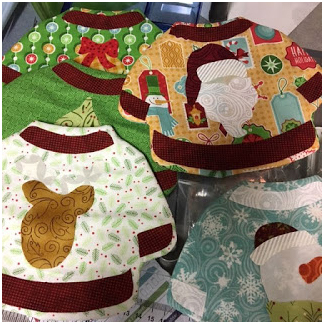 Use this link to purchase the Ugly Christmas Sweaters pattern from QuiltWoman.com.